As a webOS fan and enthusiast, we realize that you have plenty of choices when it comes to selecting a forum to chat about webOS and Palm phones. Today we’re introducing our completely new forums. We’ve got some cool features we’d like to show you that we that we think you’re going to really enjoy. Registration is free and takes less than a minute. Blazing speed when opening the forums or topics. It’s fast, really fast. Ability to create your own personalized news/activity stream by following members of interest in the forums. You can create your own gang of webOS fanatics that you select and follow. Just like Twitter, members can update their status. This allows you to stay connected with fellow members for a more personal experience. In thread avatars, so you can see who has posted and if you have replied to a thread. 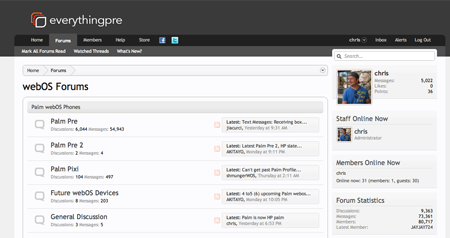 Easy access alerts, allow you to quickly see who has responded to topics you are watching or have posted in. New ‘Like’ system allows you to let other members know when you’ve liked their post. If it was helpful, entertaining or otherwise, liking a post lets other members know to keep posting more of the same. A new trophy system allows members to receive trophies for being a contributing member to the forums. Support for Facebook making it easier than ever to join us. Support Facebook “Likes” allows you to let your friends know that you’ve “liked” a particular topic. Support for Twtter allows members to reweet topics to their followers. Massive user interface improvements throughout. We think our new forums make for a truly exciting and unique forum experience. Register today and take it for a test drive. To help get you started, we’ve set up a few video tutorials that showcase some of the improvements. Have suggestions? Let us know in forums!